CCW loop, up ENE ridge, ran ridge to saddle SW of point 6714. Got slowed down descending into Fryingpan Creek basin as creek was running higher than some were comfortable crossing, and staying north of the north fork on loose moraine, creek bed, and brush was tedious. 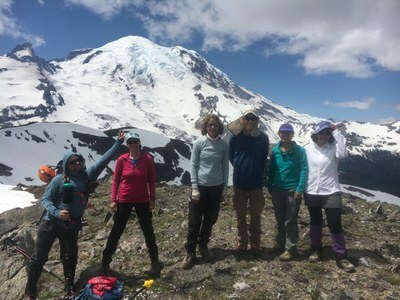 Great group and perfect weather make this one of the best scrambles for views. Saw 3 goats on ridge. About 10 hours with abundant breaks.